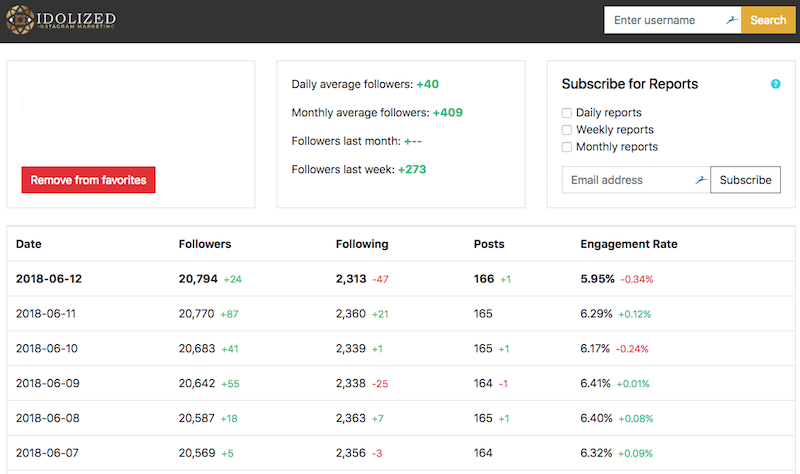 We’re incredibly excited to introduce our clients to our Instagram Growth Tracking Dashboard. You can it anytime (desktop and mobile) by clicking the “Growth Tracking” tab on the top right-hand corner of our website. All you have to do is search for your Instagram username, where it says “enter username”. Our system will begin tracking your account from the moment it is searched for. Please note, historical data is not available. Further down the page, you can also view the main metrics as graphs over time. “Save to Favorites” remember the profiles you are tracking for next time revisit. “Subscribe to Reports” if you would like automated email reports. You can search and track as many Instagram accounts as you like here, even invite your friends to try. We’ll be adding more features soon!